"Kimiyagar choun dana bovad, Khak ra kimia konad"
This is what I thought when I went to see the first major art show by Bita Ghezelayagh at the Hadi Mirmiran Gallery at Artists Forum in mid-July. 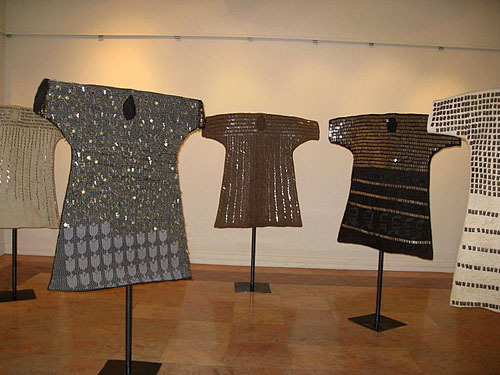 The exhibition was of her work in Felt and Silk. 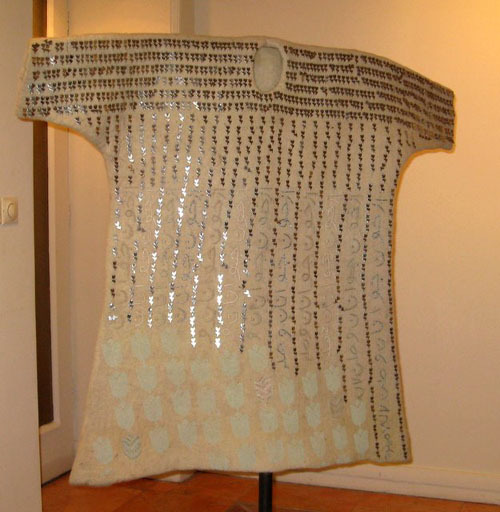 A section of the exhibition was her expression as an artist from her distant experiences of the war and revolution and all the past and present, in the form of felt covered with different shaped metals arranged by her and sewed on to the felt. I was simply mesmerized by the intensity of this part of her exhibition which had a more serious yet beautiful artistic nature. Here we encounter recent Iranian history in one look, the war, the veterans and the hardships. 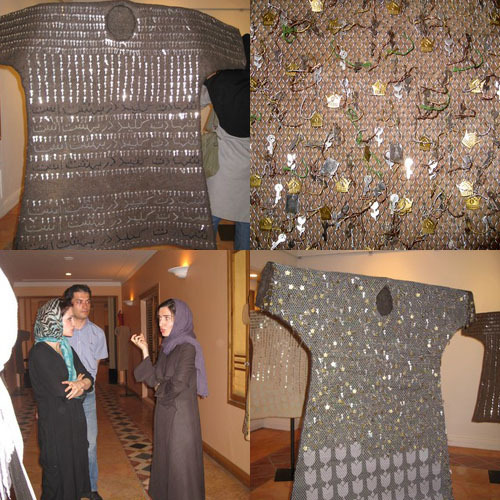 She said that she has been working on this project since 2001 when she came back to Iran from her studies in France. 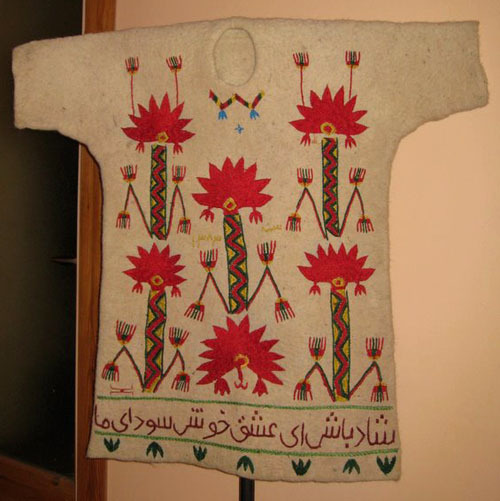 The other exhibits were made of felt in form of a shepherds top with a most enlightening and pleasing embroidery work. This is indeed a unique conceptual exhibition. 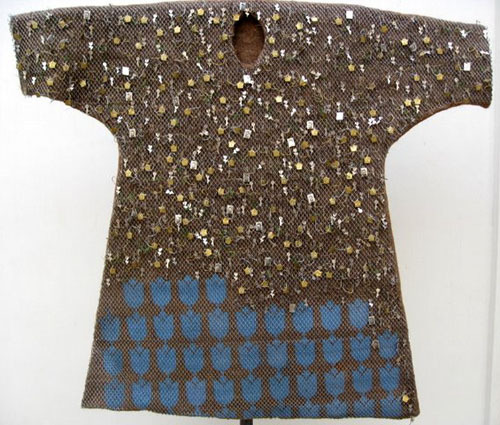 She said that through her work she wanted t o celebrate the importance of felt which has many qualities (anti fire, anti cold and natural) and has many uses, as a coat worn by shepherd, as a blanket and as a burial shroud for dead soldiers during the war. 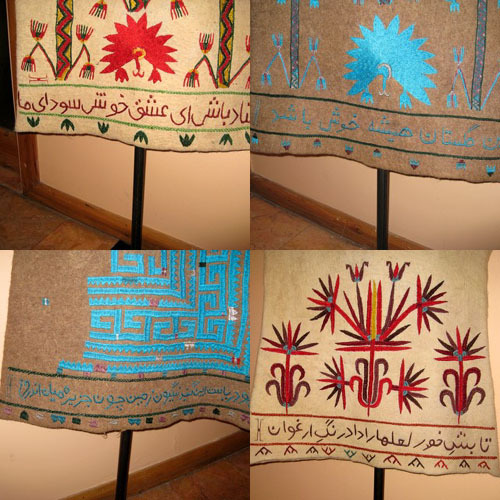 Above all it is a very Iranian and natural material. 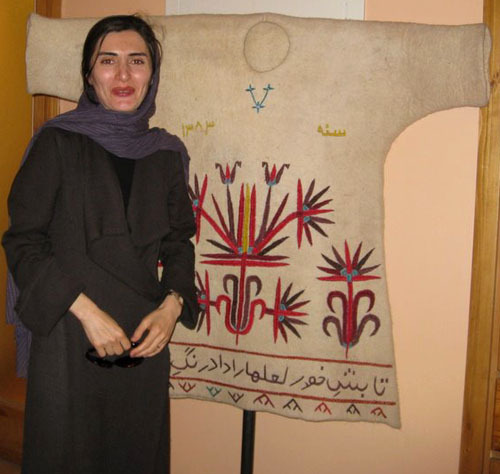 She told me that she wanted to show her appreciation of the tribal traditions with which she had become acquainted in her many travels throughout Iran and with on the road research and personal contacts. 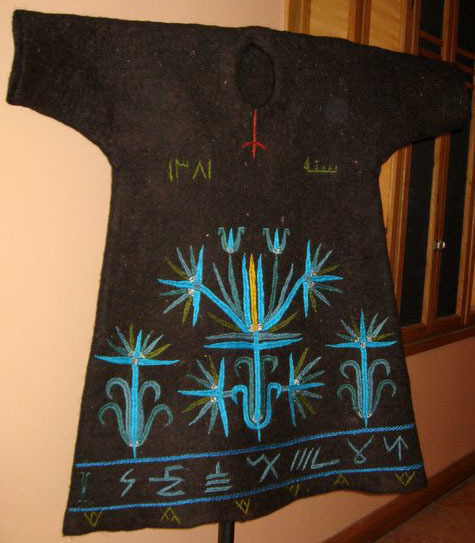 She wanted to show the embroiders art and all her felts have a line of poetry sewn on the front or a sign that the tribes use. She told me that she has been influenced by the German artist Joseph Beuys (1921-1986) for this exhibition. Besides this most interesting, innovative and refreshing exhibition in many respects, Bita, who was born in Italy in 1965, has worked as an architect and an interior decorative artist, stage manager and dress designer for three films as well as running a home and being a mother to two very young children, Jahan and Kiana. At the same time she has been working for a major exhibition in London and has been accompanying her husband, the well known writer Christopher De Bellaigue on a sabbatical in Oxford. I have no idea how she managed to get the work ready for this exhibition so quickly. She told me that she is off to Khorramabad and other places next week to make more felt for her other works and projects. I shall be looking forward to her next exhibition and I am sure you will join me in wishing her all the very best in all her endeavors and saying well done Bita!